The Walter Camp Football Foundation has announced the Football Bowl Subdivision National Offensive and Defensive Players of the Week, presented by Generation UCAN, for games ending October 31. Deshaun Watson accounted for six touchdowns (5 passing, 1 rushing) and 437 yards of total offense as third-ranked Clemson defeated North Carolina State, 56-41. Watson completed 23-of-30 passes for 383 yards, while adding 54 rushing yards as the Tigers improved to 8-0, 5-0 in the Atlantic Coast Conference. Notes: Deshaun Watson is the fifth Clemson player to earn Walter Camp National Player of the Week honors since 2004, and the first since former Tiger QB Tajh Boyd on November 18, 2012. Jordan Harris recorded seven tackles and one interception as Iowa State blanked Big-12 rival Texas, 24-0. 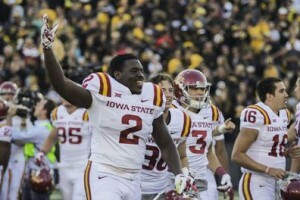 The Cyclones’ defense held the Longhorns to just 204 yards of total offense in the contest. Notes: Jordan Harris is the third Iowa State player to earn Walter Camp National Player of the Week honors since 2004, joining former Cyclones WR Todd Blythe (Oct. 30, 2005) and LB Jesse Smith (Oct. 25, 2009).